I didn’t mean to match the table cloth…. Photos from The Untold Tale book Launches! Fergus – December 11th, 2015 – Coming Soon! Guelph – December 17th, 2015 – Coming Soon! I’ve had a few questions about this recently, so for those who asked where and when you can meet me and/or buy books…. Last week of November – an interview I did with Inside Guelph will air. I’ll let you know the exact dates soon. December 5th – IT’S DONE! NOW WHAT? workshop on editing and publishing at the Centre Wellington Library, Fergus Branch. 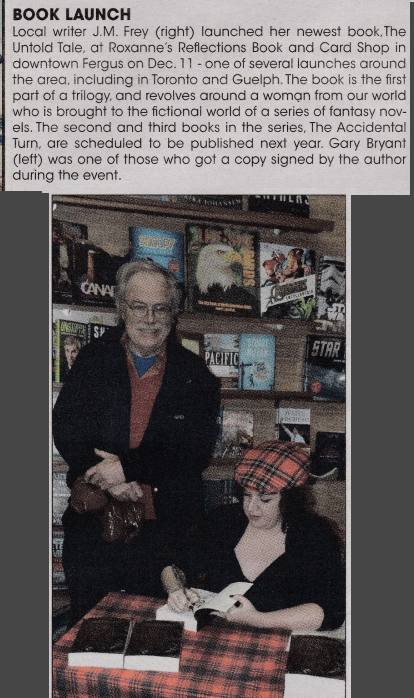 December 11th – THE UNTOLD TALE Fergus launch at Roxanne’s Reflections. Winter 2015 – IVY, the prequel comic to THE UNTOLD TALE will be released in paperback form. You can read along with the pages as they’re released here. January 26th – BOOKS & BEER, with the Elora Writer’s Festival and Wellington Brewery at Roxanne’s Reflections in Fergus. April 1-3rd – SCIFI ON THE ROCK in St. Johns Newfoundland. May 29th – ELORA WRITER’S FESTIVAL Author Event.